Situated in the south-west of Transylvania, Sibiu along with Brasov, from the most representative as far as the historical remains and the natural landscape are concerned. The city of Sibiu is rightly considered as one of the most beautiful and well preserved historical cities of Transylvania and in Europe, with a national architectural heritage spread over 80,000 square km. 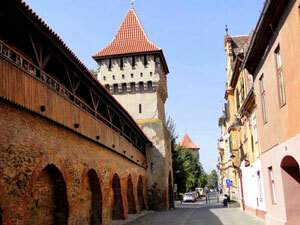 The Medieval Fortress of Sibiu was as large as the Fortress in Vienna at certain times, and is the greatest medieval monument in Transylvania It consists of walls, fortifications and towers which remain intact after the two World Wars, still preserving the spirit and the atmosphere of the old days. Some of these were so well preserved that you can easily imagine what the Fortress looked like 600 years ago. The wall on the left side is the best preserved, being the most fortified, against the attacks which came from this direction. The Turks and the Tartars frequently attacked Transylvania from Wallachia and Moldavia while these later two were under the rule of some princes serving the Ottoman Empire. Among the well preserved places in the medieval city which had an important role in the daily life,we should mention also the ’Stairs Passage’ which connected the ’upper city’ to the ’lower city’ through two sets of stairs and arcades which surrounded the walls of the fortress from the Evangelical Church. The stairs built in the 13th century still preserve their original aspect. 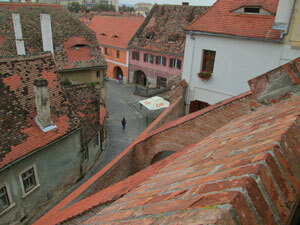 The south wing ends in the ’Stairs Tower’, the oldest building of Sibiu, dating from the 13th century. Just like in any other medieval city there were places which monopolised the social or the economic life of the community. Such locations usually were the markets and the old ’Cibinium’ was no exception: there were two such markets, ’The Small Market’ and ’The Big Market’. In the ’Small Market’ there were the artisan houses and workshops. The Market is connected to the ’Big Market’ by narrow tunnels and stone-paved narrow streets. The medieval buildings are still preserved in their original form. On the south side of the Market are situated the Catholic Church and the City Hall Tower and many small shops. On the east side there is a complex of buildings built in the Gothic style (now historical monuments) and near them there is the Pharmaceutical Museum (in a building where the first chemist`s shop in Transylvania was founded in 1568). The ’Big Market’ stands at the historical centre of the city and it was first mentioned in 1411 as a market for cereals. Almost a century passed until it became the centre of the Fortress where meetings and public executions took place. It was then called ’Grosser Platz’ (the Big Market), but during the centuries it also had other names such as ’King Ferdinand Market’ (between the two World Wars) - a tribute to the king under whose rule the great 1918 Union occurred -, or ’the Republicii Market’. In 1990 it got back its original name. This market is the largest in Transylvania: 142 m. long and 93 m. wide, its south side being a UNESCO - protected monument due to its unique architectural style. 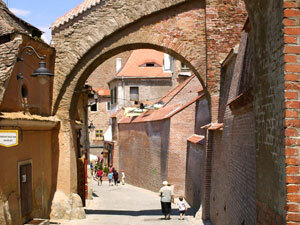 In 1376, Sibiu was a very well developed city with 19 artisan guilds and 25 professions. The city also had famous guests such as the King of Sweden Charles II who stopped here during an incognito visit in 1714. 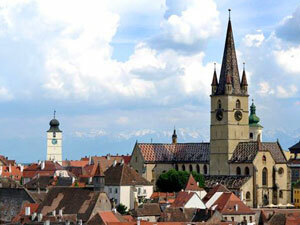 The city of Sibiu was a permanent cradle of culture as many men of letters lived here: NicolaeOlahus, Samuel Brukenthal, SimionBarnutiu, George Baritiu or IoanSlavici. In 1769, the cultural life of the city became richer as the first playhouse opened here at Baron Moringer’s residence, and in 1800 Joseph Haydn’s ’Genesis’ was interpreted by amateur musicians. Proud of its cultural heritage, the city of Sibiu follows the same tradition nowadays with of the most important museums in Transylvania and Romania, the ’Brukenthal Museum’, the ’Astra’ Museum and three more ethnographic museums. The legend says that if a man tell a lie on the bridge that one will be broken down. 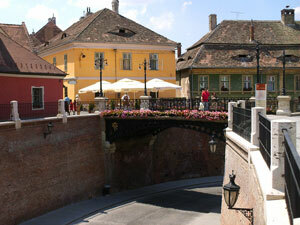 The liars bridge was the first bridge from Transylvania and Romania made entirely from metal. Built around the year 1851 instead of a lot of housese and a tunnel made in the XV-een century which connect the Uppertown with downtown in a place where was sometime an old bullwark the Liars bridge it is now one of the most important touristic attraction from Sibiu. In the year 1471 was transformation works of the church, and in 1488 was open a new chapel from it is now just the western wall. The building it is dominated by the high tower of 7 floors, with 4 small towers from the corners a sign that the mayer was right of death and life above de criminals. With a altitude of 74 meters the tower is tallest from Transylvania.Inside the churh on the walls are some epitaphs from stone dated in XVII-XVIII century. To the central althar built in the XIX-een century on the left side you can observ the roof from stone of the ex pulpit. In central area in front of the althar it is situated a gigantic baptistery made in 1438 by Leonardus from the iron taken from some turkish canons captured in battle. On the north wall it is painted a gigantic painting painted by Johannes of Rosenauin 1445, which is represent the crucification of Jesus. The fresco was repaint and renovated in 1650 by Georg Herman. 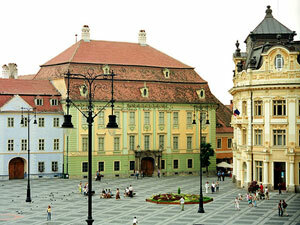 The `Brukenthal` National Museum housed by the `Brukenthal` Palace exhibits impressive collections of art being unique in Transylvania and all over the world. 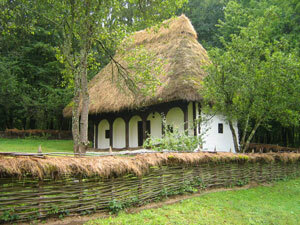 Some of the exhibits here are 600-700 years old, which is an extra reason why one should visit the museum. Between 1778 and 1788 when the `Brukenthal` Palace was built no one could have imagined that its walls would shelter the best-known museum in Transylvania. The Palace, one of the most important Baroque buildings in Transylvania was originally erected to serve as an official residence to Baron Samuel von Brukenthal, Governor of Transylvania between 1777 and 1787 and to shelter his art collections. The fa?ade still preserves the family`s coat of armours and inside there are many original objects belonging to the Brukenthals` among which rococo and neo-Classic stoves, the red silk wallpaper and the one made of paper and painted in the Oriental style, chandeliers made of Murano glass and pieces of furniture from the 18th century. The Palace houses the Art Gallery and the Brukenthal Library. The `Brukenthal` Library shelters over 280,000 volumes out of which 381 are incunabulum. Out of about 1,500 Romanian books one must mention `Varlaam`s Homiliary` (a book of sermons), the `New Testament from Balgrad` and `SerbanCantacuzino`s Holy Bible. Built in early 20th century in Byzantine style with impressive interior frescoes, the orthodox cathedral from Sibiu is one the most important religious buildings in Transylvania and a very important tourist attraction. This baroque style church was built in the XVIIIth century because during the reformation everything went in the property of the Lutherans. In 1687 the catholic life starts to regain its strength when priests hold services in private houses. The Jesuits also appear but they don't have a church. Located in the middle of a dense forest and surrounded by a beautiful lake, ASTRA features more than 300 buildings as well as watermills and windmills, gigantic presses for wine, fruit and oil, hydraulic forges and structures representing village architectural styles from many parts of Romania.